Mauritius to Mitchelstown. How a long trip pays off for Eight Degrees. Brains, brawn. Long hours and hard work too! How a long trip pays off for Eight Degrees. Brains, brawn. Long hours and hard work too! It’s not eight degrees when we visit the brewery. It’s just hovering between two and three and the Galtee Mountains are looking well under a lace-cap of new snow. Reminds me of the Swiss town of Engleberg even if the Galtees are nowhere near as high as the Alps. 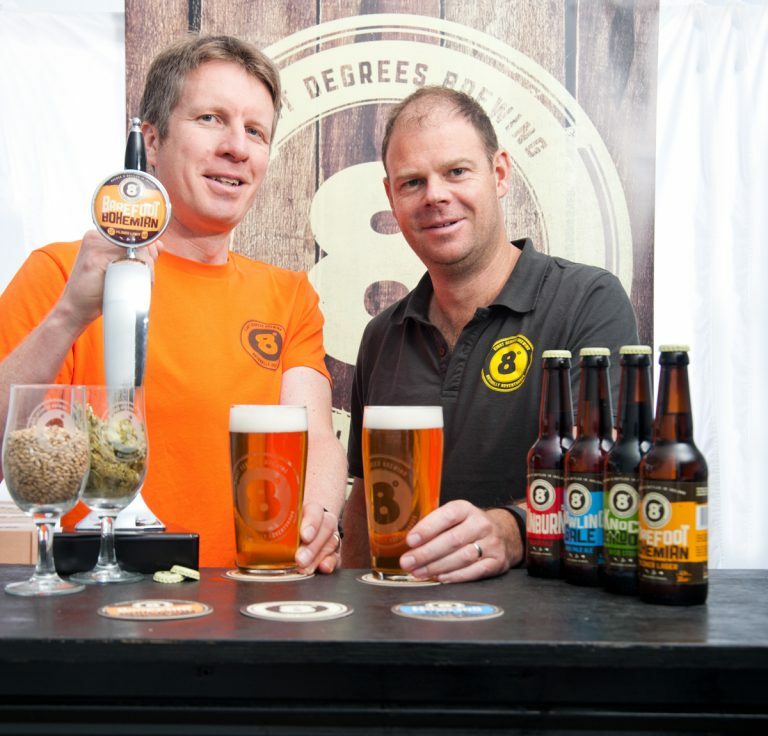 No danger of getting cold though for the founders and workers at Eight Degrees as they are mightily engaged in moving operations from the old brewery to their German giant from Mauritius. The giant has been asleep in Mitchelstown -he did after all have a long journey - but now there are signs of life as Cam, Caroline and Scott are bringing it all together in a large unit in an industrial park on the northern edge of the North Cork town. The three principals, especially Scott and Cam (seeking to make good beer like they had enjoyed down under), had started off with a home brew kit (still in use!). They had some success with that and indeed won a prize at a “home-brew” competition. 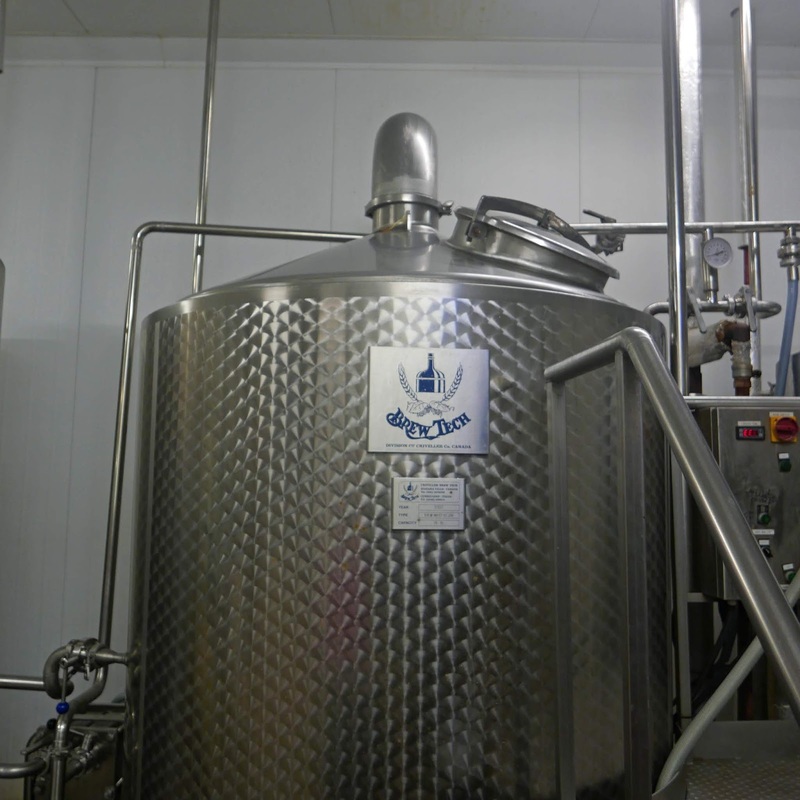 The cottage in Kildorrery was getting crowded so, having started on the serious side in 2010, they began brewing in 2011. Caroline (left) with the two of us. 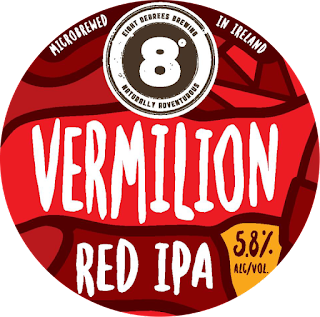 Their first real brewery, including a legendary forklift that could only reverse (work that one out), came from the Carlow Brewing Company and that too is still installed in a nearby unit on the estate and has much more work ahead of it. The home-brewing was all very well and valuable experience was gained. But it was still a nervous group that prepared for their first public outing, a beer festival at the Franciscan Well. And a shock was in store for the rookies when that batch of ale turned out to be bad! They can laugh at it now. Then though the pressure was on, big time! And the relief was palpable when the second batch was spot on and ready for the festival. But how would the public take to it? Cam and Scott waited nervously with their one beer, their one tap. An older guy (don’t think it was me!) came over and tried it, hummed and hawed for a moment or two and then gave the thumbs up. It proved quite a hit at the Well and there was no turning back for Howling Gale. It is still their top seller - just goes to show the importance of getting it right at the beginning. By the way, Bohemian Pilsner, another of their originals, is their number two. And where can you find the Eight Degrees beers? All over, basically. 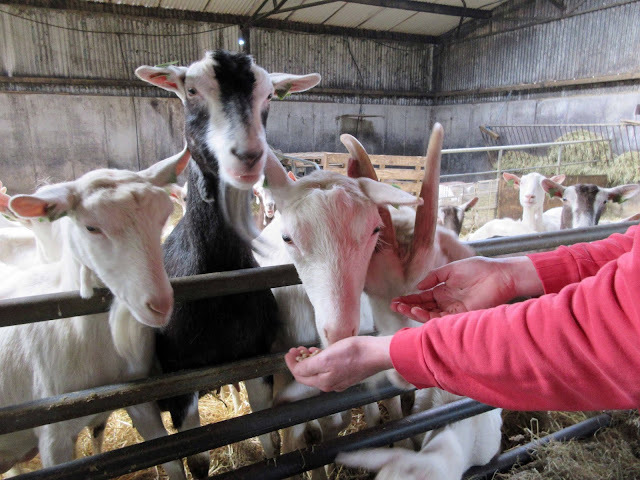 They’ve been exporting to Italy (their #1 export market) since 2012. France also takes the beers, indeed you can find them in most of Europe. The UK too of course (with that pesky Brexit question mark). Beirut in the Lebanon is a relatively new market for them and they had a very enjoyable promotion there last St Patrick’s Day. The beers also travel to Australia, Singapore, Macau, Hong Kong and they have just gone into Japan. They find it hard to keep up with the amount of outlets themselves but you can get pretty up-to-date info here. Caroline is our guide as we go through B2, their high quality, if secondhand (“there is a Done Deal for breweries” she tells us) brewery from Mauritius. By 2014, “things were looking good” for Eight Degrees, so good in fact that expansion was on the horizon though no-one thought the gate to it was lying unused on an island in the middle of the Pacific Ocean. There was quite a buzz as “the lads headed off to Mauritius” and did the deal in September 2014. 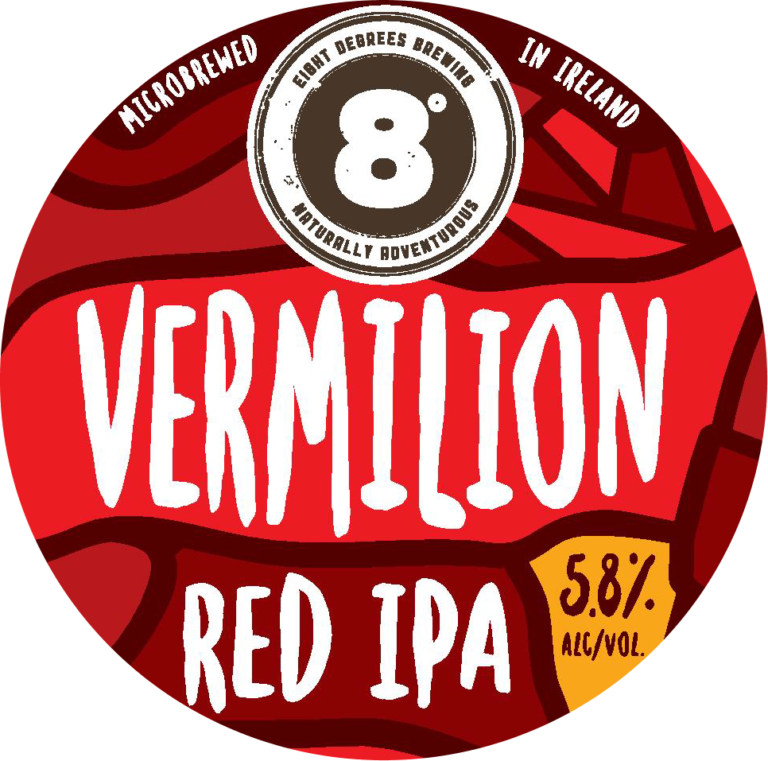 Apparently, there were two competing breweries on the island, one closed and that opened the door for the successful Eight Degrees bid. There was no delay in the delivery and it arrived in Mitchelstown in January 2015. But scarce resources meant they weren’t able to proceed with the project and B2 stayed in storage for two years or so. 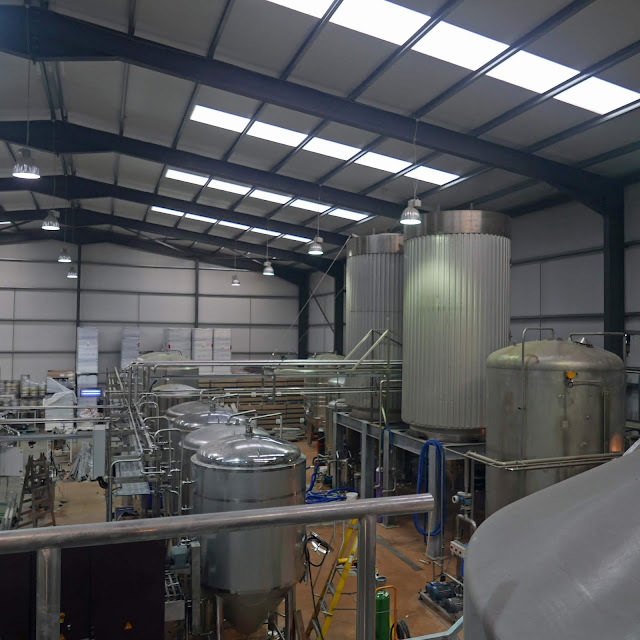 Progress was slow but their new base began to be adapted in August 2016 and it is still a hive of activity with brewing going on in what is something of an indoor construction site. 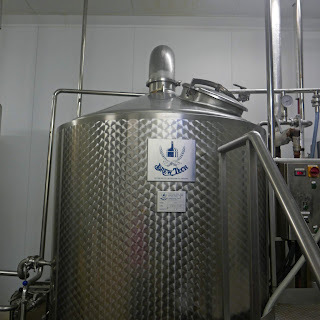 A tank from their first brewery. They thought it was big! By the way, one of the important factors for the area is that there are ten full time employees in Eight Degrees and the commissioning of B2 has given employment to various contractors. Some going! They have a bottling plant too of course as they like to keep full control of their beers from start to finish. They moved into canning about six months back. The canning is done on site by a visiting contractor and that means they can keep an eye on it. Only certain beers are canned while some are sold in a variety of formats. And Caroline told me the canning has worked out very well for them. It’s been quite a year for the trio behind the firm. 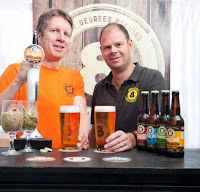 Last May, they sold Eight Degrees Brewing to Irish Distillers, Ireland’s leading supplier of spirits and wines and producer of the world’s most well-known and successful Irish whiskeys. 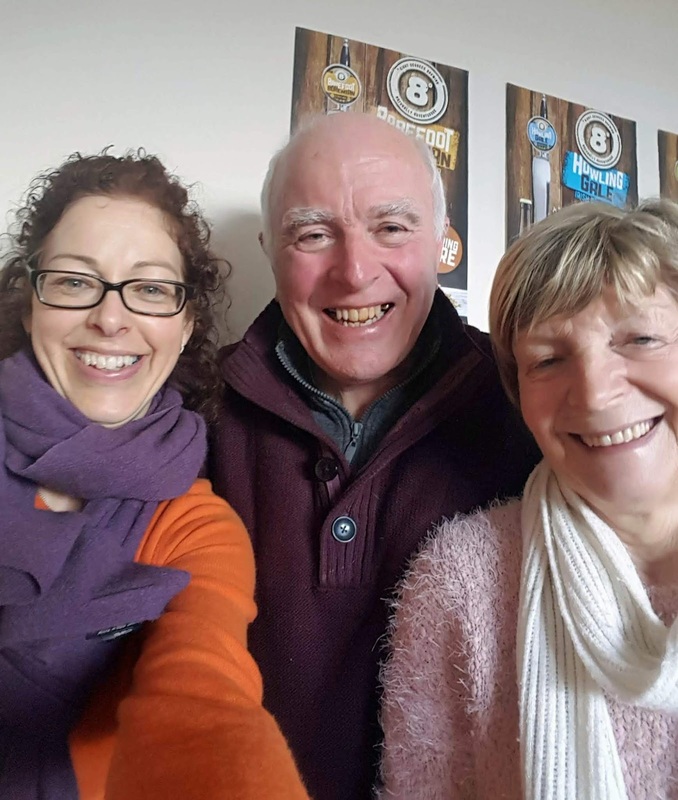 At the time, Caroline told me: When we set up the brewery in 2010, it was with the idea of brewing naturally adventurous, great tasting beers that were more exciting and innovative than anything else in the market. Becoming part of the Irish Distillers family means that we have the long-term capabilities to continue on this mission as well as being part of the very exciting Jameson Caskmates story. The recent Blowhard Imperial Stout is the first result of the union; there'll be more so watch this space. Caroline, who has a distinguished background in food writing, didn’t expect to be a factotum in a brewery. She is as enthusiastic as any of the lads. She loves the give and take between the various micro-brewers; they help one another and she is more than thankful for the help Eight Degrees got in the early days. Looks as if we can expect a flavourful future from the hard-working team at Eight Degrees!